Delivery of WeatherFrame Systems is from stock and usually ships the same day if order before 3PM EST. Below are a list of our products. Each WeatherFrame system comes with a selection of free weather content. You can add your own additional content from any internet or intranet image source or add your own advertising using the included software. 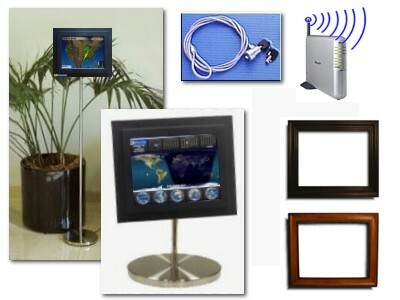 Frames, stands, cables, USB, video interfaces for Cable TV and Plasma Displays.